The Ship that now carries the name, Gen. Hoyt S. Vandenberg, has a long and unique history spanning two generations in service to her country. The ex-USAFS Gen. Hoyt S. Vandenberg was first commissioned as the troop transport USNS Gen. Harry Taylor. The ship saw service in WWII, post-war immigration, the Hungarian Revolution, and the Cold War. 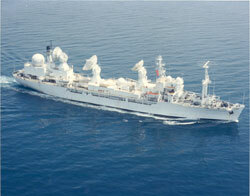 After decommissioning, it even starred in a popular motion picture. As an artificial reef, the ship will not only be a recreational resource for divers and fishermen, but will serve as an underwater classroom for the Florida Keys Community College, and be a platform for ground-breaking research in reef monitoring as mandated by the Florida Keys National Marine Sanctuary Management Plan. The ship's distinguished history will continue in its final disposition as a recreational, educational and scientific resource. Who was Gen. Harry Taylor? Who was Gen. Hoyt Vandenberg?